Location: Texas and throughout the Southwestern U.S.
Coelophysis was a swift hunter that seemed to eat almost anything with its many small, sharp teeth - including other Coelophysis! Some of the skeletons found by scientists had the remains of other Coelophysis in their stomachs, making it a cannibalistic dinosaur. Coelophysis' speed is attributed to his "hollow form" and light-weight body structure of only about 45 pounds. It is the oldest dinosaur known in North America. 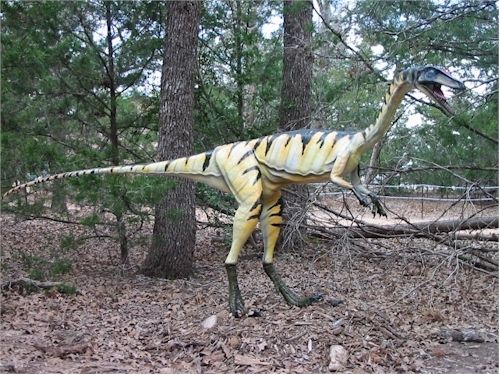 In 1947, the remains of hundreds of Coelophysis were found at Ghost Ranch in New Mexico. It is believed that a flash flood overtook this herd about 220 million years ago, burying them so rapidly that their bodies were protected from scavengers. This gave scientists an unprecedented opportunity to study the individual differences within a large herd of the same dinosaur. Even numerous complete skeletons were found at this site. It also demonstrates that early dinosaurs exhibited social behavior to the extent of congregating in large herds. A Coelophysis skull became the first dinosaur fossil to be taken into space in January 1998 when the Space Shuttle "Endeavor" carried a specimen from the Carnegie Museum to the Mir Space Station. Coelophysis is at the base of the family tree of many dinosaurs including all the Dilophosaurs, Oviraptors, Ornithomimids and the popular "raptor" family, which includes Velociraptor, Utahraptor, and Deinonychus.